From this pale pulpit of eternal muddling that the unengaged gearstick may mistake for a blog, allow me to riddle out some equilateral nonsense to be forgot among these kind posts. In other words, puzzled reader, I’ve been being poetic again. I’ve at last written my usual once-every-two-years non rhyming poem, the last of which – an ode to a favourite pen – was so awful it didn’t even get a chance to extend the Internet upon these wistful pages. I pray, therefore, that you enjoy, kindest reader. And, of course, how could I end this post without a dear sum of nonsense, written briefly by a tree. All out racing in a tub. They said they’re racing me. So I just took a chance. It turned out they had won. Fortunate as I am to have some very old pages, I have been lucky enough to recently get some even older ones. So, as I threatened some time ago, here’s a blog post on them. 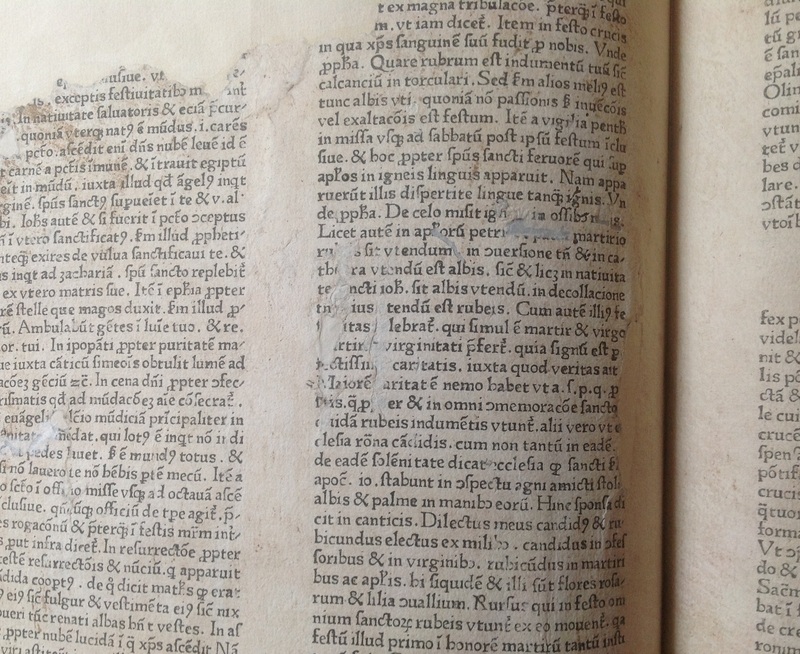 Back in Summer last year, I ended up buying a bundle of old papers from a book dealer in New England, they’d been identified by the seller as fragments of an early incunable – Adolf Rusch’s 1470s edition of Rationale Divinorum Officiorum. Rusch is, in my opinion, one of the great printing figures of history – a man who brought Roman typefaces out of Italy and introduced them to wider Europe. Essentially, if he hadn’t done that then medieval blackletter would have remained the dominant typeface without any competitor, and therefore there’s no reason why we wouldn’t still be using medieval fonts today. Rusch printed his first book in Roman type in 1469, and then further books in the 1470s. 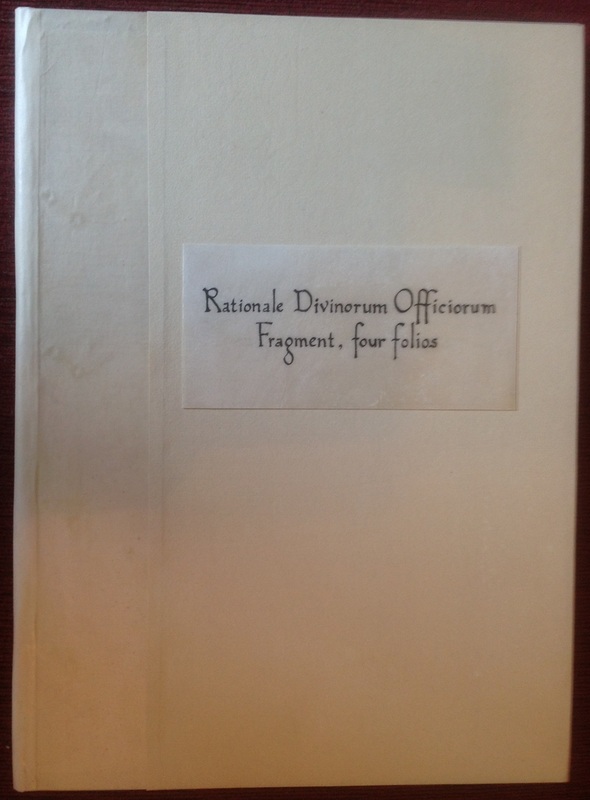 The unfortunate thing is, unlike the rest of his volumes, his Rationale Divinorum Officiorum was printed undated and is ascribed only the approximate date of 1470-1474. 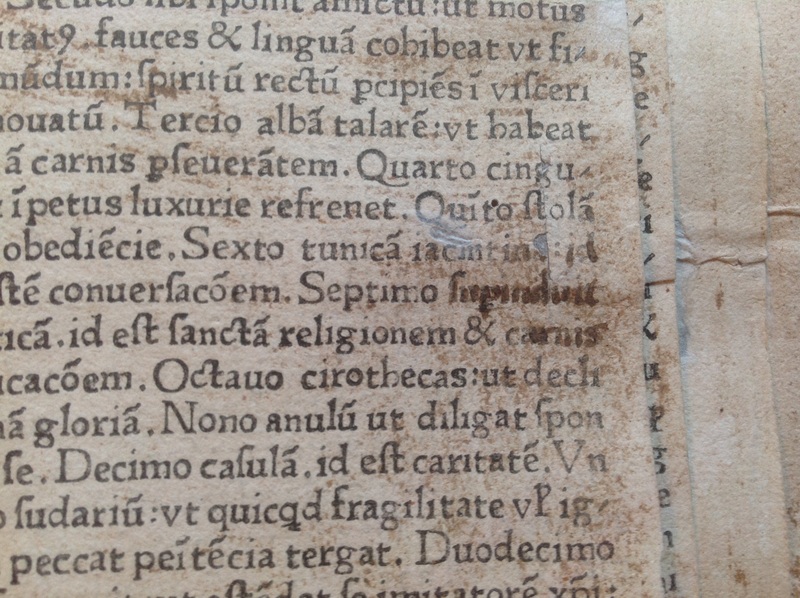 Intriguingly the paper that mine is printed on has watermarks that date the paper to being manufactured in c1468 in Strasbourg, where the book was printed. In my experience of early books and the space of time between paper being made and being printed on the gap is about 2-3 years, which fits the earliest part of the 1470-1474 bracket! Aside from the fragments now being rebound in a fine new binding, each page had been carefully cleaned and restored (the state of them suggested that they had been cut up – possibly during the reformation when catholic books were all at risk – and recycled as binding scrap). Worms and other age related wear had done their work too, so I was very excited to finally be able to handle these pages as an actual book, rather than as fragile fragments. At the end of one of a couple of consecutive lines the printing clearly hadn’t worked properly, and a couple of words had been added by hand – almost certainly by the printer or one of his apprentices – after the printing process had been done. This was a common occurrence in early printing, and up until the 17th century there are still examples of books where printers have made changes in hand to the printed text. Aside, then, from now owning a piece of printed text that was almost 550 years old, could I have hand writing that belonged to the man who brought Roman type out of Italy? For now, kind reader, adieu.